On the eve of yet another holiday weekend full of parties and grilling I started planning my menu. I have to say that asparagus is a family favorite around here. It compliments just about any meal and it is great finger food for kids. A source of fiber (3 grams per 5.3 oz. serving). An excellent source of folacin. A significant source of thiamin. A significant source of vitamin B6. *Glutathione (GSH) is one of the most potent anticarcinogens and antioxidants found within the body. GSH is used to detoxify carcinogenic electrophiles and protect cells from oxidative damage, thereby preventing damage to DNA and other macromolecules. Thus, GSH acts as an initial and primary defense against chemicals that can cause cell transformation and/or cell death. 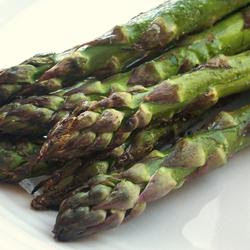 Asparagus had the highest GSH content of the several foods tested. Find a quick and easy grilled asparagus recipe here.